Of course, as with any non-profit organization, fundraising is a top priority for the Lombardi Cancer Center. 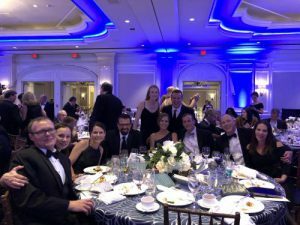 Each year, The Lombardi Gala raises a large amount of money to fund research, clinical trials, and develop new treatments for those who are battling cancer. I have served on the Gala’s Corporate Executive Committee for the past five years. Through this experience, I know first-hand how much work goes into ensuring that the Gala’s fundraising goals are hit. I am proud to say that not only did we reach our fundraising goals this year but we greatly exceeded them! The 31st annual Lombardi Gala took place on November 18, 2017 at the Ritz Carlton in Washington DC. This year, the Gala raised $1.4M for the Cancer Center. On top of that, one philanthropic individual pledged an additional $1M that evening. Since its inception, the Gala has raised over $25M towards cancer research, education, and treatment. At the Gala, those who have made a major impact in the world of cancer prevention and treatment receive awards for their efforts. Additionally, awards are presented to those who serve as an inspiration to all based on their battles with the deadly disease. Famed broadcaster Bryant Gumbel, a two-time cancer survivor, received this year’s NFL Players Association Georgetown Lombardi Award. Additionally, Jeanne Ruesch, founder of the Ruesch Center for the Cure of Gastrointestinal Cancers, received the Margaret L. Hodges Leadership Award. Listening to these two awardees speak about the impact that the Lombardi Cancer Center has had in their lives reinforced why TeraThink has made the Lombardi Cancer Center one of the premiere organizations that we support. It’s hard to find someone these days who hasn’t been impacted by cancer in one way or another. For me, seeing my step-brother struggle and ultimately lose the battle with cancer was the event that pushed me into the circle. I had been attending the event for many years as a guest. I enjoyed the food and drink, being star-struck by the NFL personalities and players, and placing winning bids in the silent auction. Volunteering for the Corporate Executive Committee led to a newfound appreciation for the amount of work required to run the annual event. I find this role to be both challenging and extremely rewarding..
All in all, it was another great event by a great organization. We are already looking forward to the 32nd Lombardi Gala. Next year, will we try to surpass the amount of money raised this year. If you would like to join TeraThink in helping fight cancer, please consider donating to this great organization.